Aglaonema is a genus of about 40 species of foliage plants in the family Araceae, native to the tropical swamps and rainforests of southeastern Asia from Bangladesh east to the Philippines and north to southern China. No common name is widely used, though they are sometimes called "Chinese evergreen". 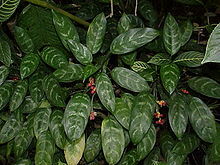 Wikispecies has information on: Aglaonema. This page was last changed on 10 March 2013, at 10:24.